For December, I thought I’d pick one of the pictures that give an idea of Geoffrey’s social life. He talks most about his social life when he was at Lindi, then in Tanganyika, now Tanzania (not Kenya, which is often mistaken by more recent historians of the route, because Malindi is both a bigger place and much too close to Nairobi/Port Bell to be useful). There were not many more than twenty Europeans and at that time there was considerable tension between Britain and countries like Italy, and even Greece, so easy friendships weren’t that ‘easy’. It was a time of Colonialism, and the different Colonial powers stuck to their own for social engagements. 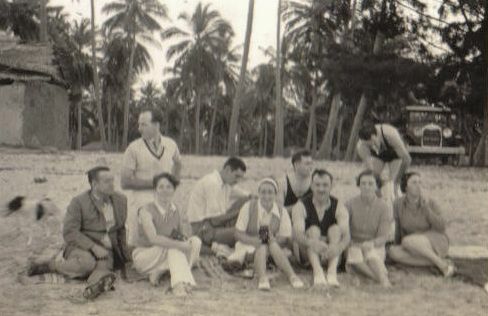 So the photo above, of a social group on the beach at Lindi, pictures most of the people stationed there at the time. There was nothing to do at Lindi, and people had to be resourceful. There was not even much food, so gatherings and parties involving food had to be inventive. Geoffrey talks of his pig ration, and his popularity when he managed to start keeping chickens. He only had flying boats coming through four days a week (one a day), and unlike his earlier posting at M’Beya, where he ran the ‘hotel’, Lindi was a refuelling stop, so he didn’t meet the passengers either. It makes me realise why the visit of HMS Emerald was such an event for everyone there. What is clear, though, is that these resourceful people had a vibrant social life; the experiences Geoffrey talks about do not figure much in his other postings. The trips into the bush, meetings with local tribes and interaction with the villagers; the relationship with the two sisal growers, and the visits to their estates, all given plenty of memory time. Riding on the narrow gauge steam train one grower had (to access his estate better) must have been great fun. In Juba Geoffrey makes much of the library he set up, which gives me the impression that they didn’t even have much in the way of reading material at Lindi. Yet Geoffrey always talked of Lindi with love and affection. To me it took on an aura of magic. I suspect a lot of this was the idyllic climate, certainly compared with other parts of Africa he was posted to. Lindi with its beaches, sea breezes and date palms must have been very pleasant. It was not ‘healthy’, though. He never spoke of it to us, but it was clear he contracted malaria and had many bouts of sickness there. 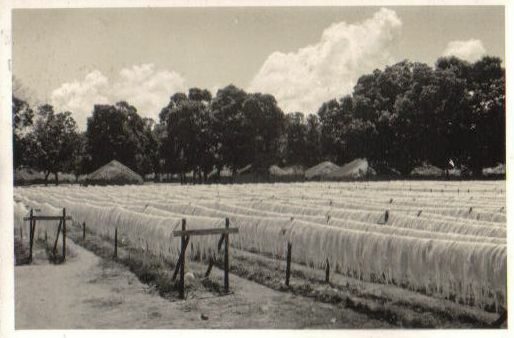 But the other thing was, he was 22, had enough experience now to feel confident in his work, and he had just had a major achievement – setting up the station from nothing to become a key stop in the South Africa flying boat route. I don’t think our youngsters have enough challenge, these days! ← Picture Prompt – Arriving or leaving?